Kama Sutra’s bodycare products all carry a scent of flavour, one of these scent families is Tropical Mango. Tropical mango has the sweet scent of fresh, ripe mangos and was already available as an oil of love, a kissable body oil, and as a natural massage oil. 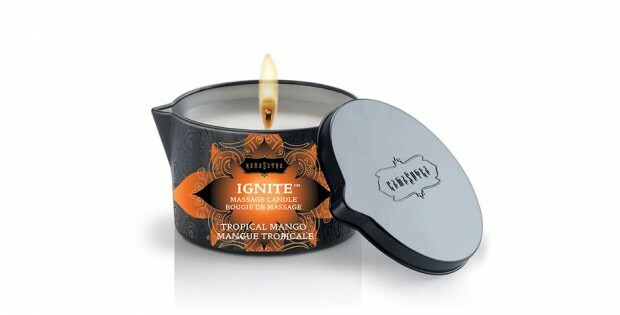 As an addition to this scent family the brand added an IGNITE massage candle with the tropical mango scent. It is an exotic, scented delight made of a rich formula of skin-conditioning coconut oil, shea butter and vitamin E that melts into a warm massage oil when lit. Kama Sutra’s massage candles are wax-free and they naturally burn at a low temperature so they won’t harm the skin. Kama Sutra is a romantic lifestyle brand with one purpose: making love better. The brand has a range full of romantic bodycare products and pleasure instruments to enhance sexuality between lovers.